Posted on July 22, 2018 by It is pretty. The Bottom is Route 686. The locals call this little curve of land “the Bottom.” I’ve been told stories about the Bottom my entire life, some are so good that they are told regularly. But I am the only person in my immediate family who has never lived in the Bottom. While I don’t have many personal stories or memories of the Bottom, I feel like many of the stories of my parents, aunts, uncles, cousins, and neighbors are mine because they include so many people and a place I love. Daddy was born in the family homeplace in the Bottom, down near the restaurant. The small wood frame house sits right on the bank of Slate Creek. The creek was the community playground – a place to swim, skip rocks, or enjoy a cool breeze. It’s mostly clear and shallow, its floor covered with smooth stones. But, after a big rain the creek might visit the backyard or basement or sometimes the edges of the bridges leading to Big John Stacy Road or the High School. The house sat atop a basement with the kitchen and bathroom in the back that faced the river. The family room and a bedroom at the front of the house faced a small yard and the one-lane road that traversed the Bottom from east to west. The small yard and one-lane road were framed from the living room by a picture window. It let the morning and evening sun peek in to brighten the brown wood paneling on the walls. And it was one of Granny’s prized possessions. This little house was home to my grandparents and all my aunts, uncles and a few cousins. And as my cousin Scott would say, Granny’s house was the first place many of us ever saw Uncle I.D. laying on a couch, but that is a story for another day. It was also where my family started. On a fall afternoon, soon after Daddy returned from his two years in the Army, he and Granny sat in the little wood-paneled living room watching TV. The living room held a couch, a couple of chairs and a television. Sometime that afternoon my Aunt Martha came home with a friend she thought should meet my Daddy. My parents met in the front room of that little house. Growing up it was clear that my Daddy and his siblings loved their Mommy dearly. Granny is often a topic of conversation, she has at least two namesakes, and she is universally, by male and female children, called Mommy. My Mommy has always described my Daddy’s sweet relationship with Granny in the story of the first time she ever saw him that fall afternoon in the Bottom. She says, sometimes with a grin or an eye-roll that “the first time I met your father was in the living room your Granny’s house. Granny was sitting in a chair watching TV and your Daddy was sitting at her feet. That should tell you something.” This is a picture of our family, and maybe many similar Appalachian families – staying as close as you can. I love this story and the mental picture it paints of Granny’s oldest boy sitting with her on a random afternoon. As I end my first month of marriage I hope that the same closeness and affection live on within and among my parents and me and my new family. I hope that we all stay as close as we can regardless of age or circumstances. Many good things happened in the Bottom, including the beginning of the marriage that created me, in the crowded living room at Granny’s house. Posted on April 9, 2016 by It is pretty. I recently met with a former coal and gas executive from the Midwest. He used to travel to Central Appalachia – Eastern Kentucky – to supervise mining operations. This is same section of Central Appalachia where I was raised; in fact the mines he visited were within an hour or so from my childhood home. He shared a couple of great Central Appalachia tales with me – gun-wielding grannies and copper thieves. But the most interesting description he gave was about how he felt in the mountains. He had never been in mountains so steep or been in a place where the sun comes up before you can see it and it disappears behind a mountain before it gets dark. This made me think about how those mountains make me feel. To me those mountains are like a warm blanket surrounding, nurturing, and protecting all who walk under them. Keeping the good in and the bad out. Then I thought about how the landscape of the Midwest, where I live now, made me feel when I first arrived. The word that immediately came to mind was exposed. I felt exposed by the size of the sky, the distance of vision, and the constant wind. I have never been exposed to this much sky for this length of time (thus my fixation with sunrises and sunsets). In the mountains of Central Appalachia the sky is always framed with the jagged edges of tree limbs and mountaintops like a giant living, real-time painting. This discussion reminded me of a quote from a book I read in college – Salvation on Sand Mountain by Dennis Covington. Mr. Covington writes about his drive from Alabama to and through these very mountains and my hometown of Grundy, Virginia. All along the highways through Tennessee and southwest Virginia, the signs were everywhere: Crazy Joe’s Fireworks, Jack Daniel’s whiskey, drag racing, turkey shoots, and barbecue. The South they suggested was straight out of the movies – idiosyncratic, lazy, restless, and self-absorbed. And that was what Jim and Melissa and I talked about on the drive, the discrepancy between the South of the popular imagination and the one we lived and worked in every day. But once the road narrowed and entered the mountains, the signs disappeared, replaced by mine tipples, mantrips, and long lines of train cars filled with coal that steamed in the rain. The last motels and hospital were at Grundy, Virginia, a mining town on the lip of a winding river between mountains so steep and irrational, they must have blocked most of the sun most of the day. It is difficult to imagine how children can grow up in such a place without carrying narrowed horizons into the rest of their lives. But Grundy was an oasis compared with the country between it and Jolo. He, like my friend, saw the mountains as hard – hard to adjust to, hard to live in, and hard to understand. They immediately saw the limitations of the mountains. As a child of those mountains it never occurred to me that the mountains were limiting, restrictive, or negative. It never occurred to me that the mountains were preventing me from seeing something more. When I lived in the mountains I never missed the orange and pink glow of the sun as it came up and went down along the horizon. Rather, I enjoyed the light as it slowly lowered down the hillside in the morning and as it retreated up the hillside in the evening. Neither one is limiting, only different. In order to walk down the side of a hill without falling adjust your stance, turn your feet horizontally and descend slowly. If you want to create an extra source of water for yard work then you dam up a section of the creek, gravity feed the water down the holler, then pump it up the hillside. Always make sure your walking stick is sturdy. Never kill a black snake, because it eats the rodents. Be careful what you do at the head of the holler because it will show up at the mouth – it all runs downhill. Respect everyone and things that are bigger, stronger, and/or more powerful than you – the mountain, weather, a loaded coal truck, bears, and water. Never kill a mama bear or a deer that isn’t big enough and throw the fish back. If you kill it, then you eat it. No waste. Don’t be a wimp. Play when you are hurt, work when you are tired. Never forget where you came from or deny your family. All those lessons live on and color the life we make in and out of the mountains. Just like the mountains, those lessons are timeless. And what we learned from and in the mountains can carry us far beyond and right back to where we started, if we choose to wander. The mountains don’t narrow our horizons, only we do that. Posted on October 19, 2015 by It is pretty. What is the oldest thing you own and why? I was at a dinner party recently where the hosts used a question game to keep dinner conversation moving. Everyone at the table drew a question from a basket and shared their answer with the group. My question was something about what I do on my days off. But this question – what is the oldest thing you own and why? – has stuck with me. I thought about it on the drive home and woke up thinking about it the next morning. I first thought of my grandmother’s ring that I wear everyday. It is old. Then I thought about my Uncle Jim’s turquoise bracelet, it is old too. On my way into the garage to leave for work I saw the oldest thing I own. It was sitting in the garage waiting to be moved into the house. 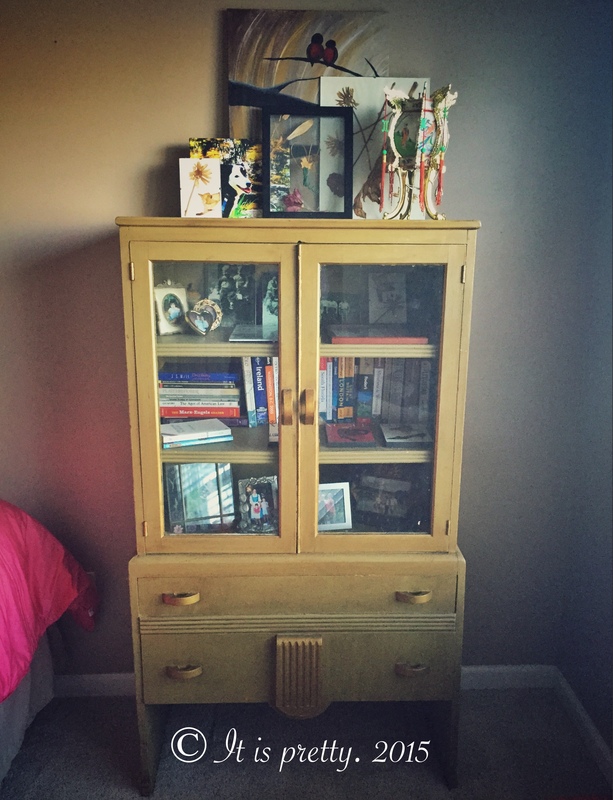 At the end of summer, my Daddy delivered a cabinet to my house that belonged to my grandmother. For as long as I can remember it lived in her bedroom. She kept lots of things in it – VHS tapes, trinkets, or blankets in the windowed shelves. In the drawers were cancelled checks, mementos from trips, scarves, and gloves. I remember waking up as a child in her bedroom and seeing that cabinet first thing in the morning. I know the feeling of the cabinet doors catching as I opened and closed them because the door frames are no longer even. This cabinet was part of her house, part of the experience of living there. It was a fixture. I used this cabinet when I moved into her house in 2006, after she was gone. I used it in the same room and in same ways, minus the cancelled checks, for the next five years. On the way to work, I called Daddy and asked him about the age of the cabinet? It was older than I thought. It originally belonged to my great-grandmother and according to Daddy it could date back to the 1920s or 1930s. The cabinet’s current home in Indiana. I thought about the why, why do I have it. It wasn’t that it was given to me, I asked for it. I wanted it more than I wanted the darkly stained regal-looking claw-foot cabinet that my sister has in her home. Comparing the two this one is not much. It is the same green color it has been for the last 40 years and lined with the same floral paper my grandmother put in it 20 years ago. And until its arrival in Indiana it probably had never left Buchanan County, Virginia. It has stood watch in her house for many years and if it talked it could tell many stories – births, deaths, holidays, and everything in between. For many years it was positioned against the wall across from where she knelt every night to pray and was the first thing she saw every morning. It was something she touched nearly everyday and when you open the drawers today it still smells like her house. I can’t look at it and not think of her or her house on the mountain that at one time or another was home to every member of my immediate family. You can’t buy that. Posted on August 14, 2015 by It is pretty. When I travel I always endeavor to find something interesting to do other than the usual tourist attraction. This is especially true in places I’ve visited before. Sometimes this involves music, like the time I happened upon a Billy Joe Shaver concert at an art opening in Houston. It was such a small event we were able to have a good long visit with Billy Joe (a national treasure). Other times it’s a museum exhibit. That is how I got to see the history of dresses (or something like that) at the Fashion Institute of Technology in New York. This week I was reminded of one of these experiences I had in Durham, North Carolina. I was in Chapel Hill to see a friend and in a Google search prior to the trip I found an exhibit at a letterpress, graphic design, and print shop called Horse & Buggy Press. I had never heard of Horse & Buggy, and had no reason to, but was immediately drawn in by the name of the exhibit. 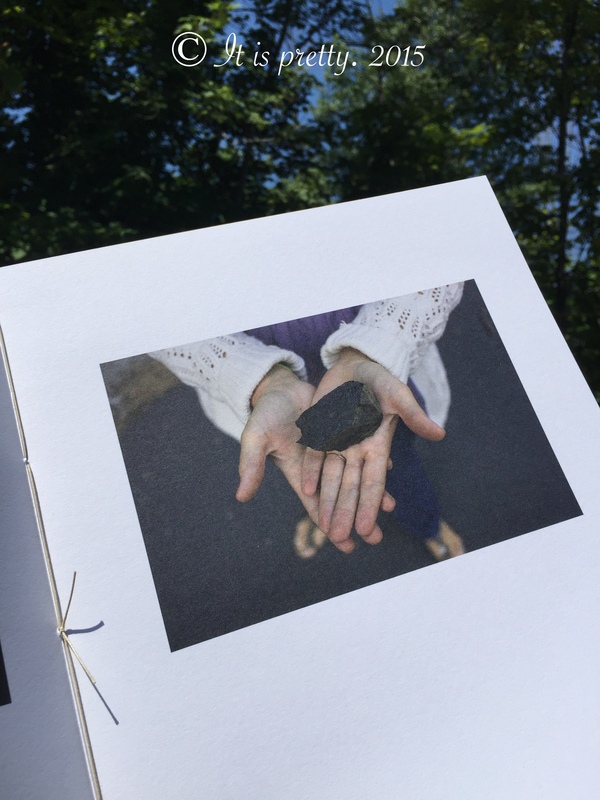 It was called Testify: A Visual Love Letter to Appalachia by Roger May. My childhood friend and I arrived at the print shop thinking this was as much an art gallery as a print shop. Not so much, but what we found was beautiful. While the majority of the first floor was a print shop there was a small lobby near the door that served as the gallery. Horse & Buggy printed Mr. May’s Testify, a limited edition, two-volume set of books featuring 50 photographs of Southern West Virginia and Eastern Kentucky. Some of the photographs from the books were displayed in frames on the shop’s walls near the front entrance. Mr. May’s photographs were stunning and moving. Many of his photographs in Testify were taken less than an hour away from my childhood home. He captured with great care scenes from Central Appalachia as it is and has been for most of my life. I immediately bought the books and currently display them on my living room coffee table. I see them every day. I recently showed the books to my father, a life-long resident of Central Appalachia, who was a bit flippant about looking at them. I imagine he was thinking that I was forcing him to appreciate some silly art or weird music (he knows his child). That changed when he realized what he was looking at and then he slowed down, his face softened and he looked with interest and more care. He saw something he knew. He said “I drove by this last month.” It is an amazing thing to see the things and places that you love captured in beautiful and respectful ways. That is what Mr. May did in Testify and does in his work. He displays the truth and beauty of Central Appalachia, including its idiosyncrasies and flaws, in a caring and respectful way. This is my testimony of how I came to see the importance of home and my connection to place. After moving away as a teenager, I’ve struggled to return, to latch on to something from my memory. These images are a vignette into my working through the problem of the construction of memory versus reality. My work embraces the raw beauty of the mountains while keeping at arms length the stereotypical images that have tried to define Appalachia for decades. Mr. May’s first run of Testify went on to sell out. Currently, there are not plans for a second edition (although I bet if Horse & Buggy gets enough requests they might just do one). I had never heard of Mr. May until I stumbled upon Horse & Buggy. He describes himself as an Appalachian American photographer and is most recently well-known for his work on the Looking at Appalachia project. You can read about it in National Geographic and the New York Times blog. He has a fun Instagram feed (@walkyourcamera) and a giant tattoo on his chest that reads Montani Semper Liberi – Mountaineers are always free, the West Virginia state motto. He is serious about Appalachian and I love that. 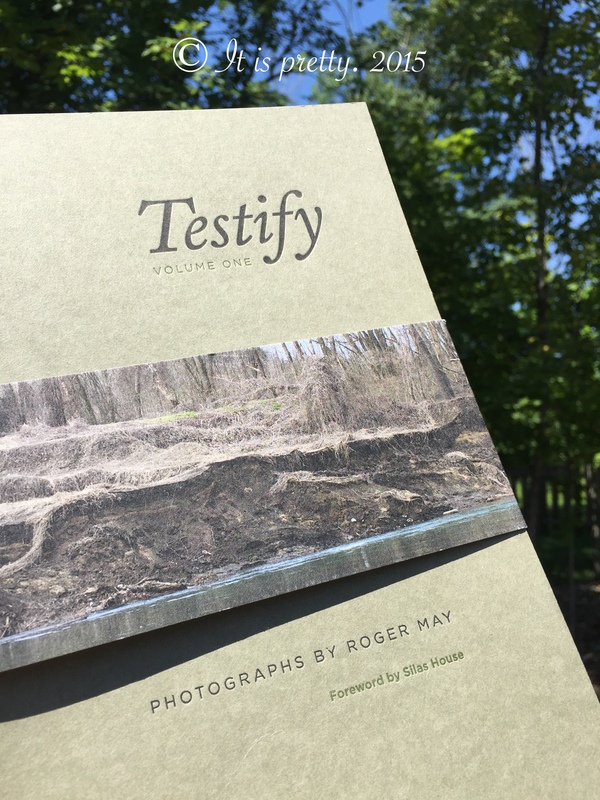 This week on Instagram Mr. May announced that he is selling his personal copies of Testify on a first come first serve basis. That post reminded me of what a treasure I found in an unlikely place on a random afternoon in Durham. I am grateful for Mr. May and his work and love for Appalachia. I am also grateful for adventures that lead me to wonderful new people and things. My Appalachian Accent: You Aren’t From Here Are You? Posted on August 4, 2015 by It is pretty. This week I met a woman who seemed surprised that I still have an accent after living in Northeast Indiana for nearly five years. Her surprise made me think about the regular conversations I have about my accent and dialect. The following is an example of a typical exchange that occurs multiple times a week, still, with new colleagues, business people, clerks, tellers, and others I talk to as I go about my life (I talk a lot). Midwesterner: Where are you from? (Sometimes they guess and when they do it is most often Texas, Georgia, Tennessee, or Kentucky in that order. The people who guess the last two know accents. The first two are way off). Me: I am from Virginia. Me: Southwestern Virginia in the mountains near Kentucky. Midwesterner: Oh, yeah, West Virginia. Me: No, but West Virginia is only about 15 minutes from my Mommy’s house. Midwesterner (usually looking confused): When did you move? Me: Four and a half years ago. Midwesterner: Oh. Really? You’ve been here a while. (Looking shocked). This is the problem when you have a pronounced accent and dialect and you don’t do a lot of code switching. Code switching is defined by dictionary.com as the alternate use of two or more languages or varieties of language, especially within the same discourse. Code switching as it relates to Appalachian dialects and accents is discussed in a delightful post on The Revivalist. My accent and dialect are pretty standard Central Appalachian. I do not have the thickest accent compared some other people from the mountains of Southwest Virginia, Southern West Virginia, Eastern Kentucky, East Tennessee, and Western North Carolina. My accent and dialect have not changed much since leaving home in 1997. Although I have noticed that occasionally instead of saying r-eye-ght I will say right in a more neutral accent and ain’t slips out far less than it used to. My brother-in-law recently called me out for saying “soda” instead of “coke” or “pop.” Otherwise, my accent is pretty static. When I moved to the Midwest I assumed that people would take note of my accent as it happens quite often in other places, even in some parts of Central and Northern Virginia. I dealt with this in college at the University of Virginia, as I have traveled through the United States and the world, and most recently and intensely in my time in the Midwest. Most people are nice about it, even though they sometimes point out my accent as though they are pointing out a pimple or a gray hair. They say that they think it is cute or charming. Sometimes this goes too far when I am asked to “talk some more” as though I am a performer. While others, not realizing how personally I take the way I talk, might crack a joke about my family tree or being a hillbilly or redneck, but they are not the worst. There is a small group that I encounter from time to time who judge me immediately as ignorant, racist, or wrong. My accent immediately gives people information about me and it is always filtered through the listener’s opinions of Southerners, and more specifically Appalachians. Recently, I’ve heard “maybe if you stay here long enough you’ll learn how to talk.” This Midwesterner was teasing when she said it, but I believe, as it has often been said, that there is an ounce of truth in all teasing. Then there was “it’s because you sound so different,” offered as a reason for the people not being welcoming. Right or wrong, it is clear that people have a hard time ignoring or accepting a different accent without question or comment. But I have noticed that I am a bit weary of explaining the way I talk. There is a kind of lonely in living in a place where no one talks the way I do. It certainly draws people in and creates conversation, but not always in a comfortable way. And there is a fear that those that ask about it and some who don’t are assuming the worst about me. Over the years I have heard friends from home say that they hate our accent. Many of those friends moved away and made a conscious effort to change the way they talk. While I will never consciously change my accent or dialect, I understand better now why others do. I will work hard to keep my accent, but my experience in the last five years makes me empathetic for my Appalachian friends and family who made those changes. I get why they did it. It can be tough living in a place where no one sounds like you. Posted on February 2, 2015 by It is pretty. On January 22, 2015, The Atlantic published a feature by Olga Khazan – Life in the Sickest Town in America. Ms. Khazan, who lives in Washington, D.C., subtitles her piece with this sentence: “I drove from one of the healthiest counties in the country to the least healthy, both in the same state.” The town she bills as the sickest town in the country is my hometown – Grundy, Virginia. When I am asked the question: Where are you from? I give the same answer every time. I am from Grundy, Virginia. Although I now live out-of-state, when I think of my hometown I think of the most beautiful, kind, and loyal place. And when I return to Grundy, as I do frequently, I find exactly that. When we go to Grundy, Ms. Khazan and I, we look for different things, and we both find what we are looking for. I find a place to be proud of and she finds a backward, sad, desperate community that time forgot. Ms. Khazan attempts to illuminate some important issues that many towns in Appalachia struggle with – health and well-being, health care access, the disability system, and the decline of the coal mining industry. Sadly, though, any positive intent and material she may have had or presented were overwhelmed by her exaggerated, inaccurate, and stereotypical portrayal of Grundy as a poor, sick, and backward Appalachian town. Ms. Khazan, a staff writer covering health for The Atlantic, isn’t the first reporter who has come to our little town from the big city with her own vision of what is in Appalachia. Perhaps colored by visions from old black and white photographs, it appears these reporters come to town to search for old women in aprons standing by outhouses, long lines of coal miners leaving the mine with picks and shovels over their shoulders, or dirt roads populated by nothing but camp houses and trailers. Some of those things still exist in Appalachia, but those visions and pictures are not the predominant way of life in the region or in Grundy. However, as Ms. Khazan has demonstrated, if you look for it, you will find it. This approach to journalism is a disappointment and a disservice to the people of Grundy and the readers of The Atlantic. Ms. Khazan, in addition to various statistics on unemployment, receipt of disability checks, and some health statistics, supports her claim that Grundy is the sickest town in America with a visit to the Buchanan County Remote Area Medical (RAM) event. RAM is an annual event where hundreds of people are provided free health care, including general medicine, dental, women’s health, and vision services. The event in Grundy draws people from beyond the local area. You can find people from Eastern Kentucky, Southern West Virginia and other counties in Southwest Virginia at the event. The article does not mention that the patients at the RAM event come from a large area; rather it would have you believe that this event is only for local citizens and the immediate surrounding area. This is a misstatement. But let’s give the benefit of the doubt here and assume that Ms. Khazan simply failed to ask the right questions to elicit this information or to perform a basic Google search on RAM. But that doesn’t explain the bigger misstatements in her article. Ms. Khazan takes the typical Appalachian stereotype one step further. She states “But if this place has the scenery of the Belgian Ardennes, it has the health statistics of Bangladesh.” With little evidence, she pronounces Grundy to be the equivalent of a third world country. She offers no analysis, only a link to the Buchanan County health statistics. It is a sensational line, but it is a shallow and unfair comparison. Health care access is a universal problem, it is in small towns and big cities and everywhere in between. The RAM event in Buchanan County is held at a large, modern elementary/middle school that serves around 1000 students from kindergarten to eighth grade. The article describes the building as one of the “few buildings, really” in Grundy. In truth, there are new and old buildings within the town limits, including the three-building Appalachian School of Law campus, a brand new Baptist church, a Masonic temple, two new two-story retail and commercial buildings, a two-story parking garage with a Wal-Mart atop it, a movie theatre, a bank building, a historic courthouse, and numerous other buildings. In order to reach Riverview Elementary Ms. Khazan had to drive past all these buildings. Additionally, outside the town limits, but within the county and on her route into Grundy, she had to drive past the two-building Appalachian College of Pharmacy campus, a 50,000+ SF Food City grocery store, various restaurants, retail stores, and churches. So, for Ms. Khazan’s article to state that the school is one of the few buildings in town is completely and totally inaccurate. However, it does support her vision of an Appalachia that is a desolate, sad, and empty place. To Ms. Khazan’s credit, the article fairly addresses some of the economic and social issues in the area related to health and the decline of the coal industry. However, the article completely misses an opportunity to explore local efforts to improve this economic situation. For example, the article never mentions the local government efforts to revitalize the economy through higher education, which has produced both a fully accredited pharmacy school and law school, or other efforts, which are numerous. If Ms. Khazan had approached this article, and Grundy, with an open mind, she may have gotten a better story – one that showcased ideas that are innovative, progressive, and that showed the enterprising spirit of an unexpected area of the country. The truth is, Grundy is a place that is trying to improve, to change, to survive, in spite of the economic and social issues that Ms. Khazan mentions. But that truth doesn’t fit within the Appalachian stereotype of ignorance and helplessness that she was looking for. Ms. Khazan is nothing if not committed to impressing her stereotypical beliefs upon The Atlantic readers, even if that proves a difficult task. Relying on Martin Wegbreit, the director of a legal aid society in Richmond, VA (350 miles away), she states, “there are only a few paved roads in the county.” When I contacted the Buchanan County Highway Engineer he reported that 93% (421 miles out of approximately 450 total miles) of the state maintained primary and secondary roads in the county are paved. Ms. Khazan’s route to Riverview Elementary/Middle School for RAM, and assuming she actually went to the law school and social services to conduct her interviews, would have taken her on Routes 83 and 460. Both roads are state maintained paved roads. I confirmed with the county engineer that there are no dirt roads that intersect with Route 460 or Route 83. It is hard to imagine that Ms. Khazan encountered a dirt road while in Grundy, and if she did it was one that she went looking for because they are very hard to find. Instead of relying upon local sources or her own experience she choose to report as fact the remarks of someone sitting behind a desk 350 miles away. What’s not hard to find in Grundy? Grocery stores. Ms. Khazan relied again on Martin Wegbreit, when he told her that Grundy did not have a grocery store until recently. This is laughable. The chain of Food City grocery stores, which includes 96 locations through Kentucky, Virginia and Tennessee, is owned by a family from Grundy who opened their first store in Grundy in 1955. Grundy currently has three large grocery stores, including Wal-Mart. Ms. Khazan drove by all three of these grocery stores during her visit to Grundy. Yet, she reported totally inaccurate information. I was not present at the interview with Martin Wegbreit so I am not sure what he said but if he indeed said what he is quoted as saying, I will simply state that Martin Wegbreit lives in Richmond, and is not a journalist purporting to report fact. In this feature, Ms. Khazan picked few named sources, but instead relies upon generalizations like “the majority of the people I talked to were missing some of their teeth.” She picked her subjects at a free clinic that provides dental services. So, I imagine that was true. But she doesn’t explain that; she would rather imply that Grundy is full of people with no teeth. That is the image she wants to sell. The bottom line is that the picture Ms. Khazan attempted to paint is not true. It is not true that most people do not have teeth. It is not true that most homes are trailers. It is not true that the only restaurants are Dairy Queen, Long John Silvers, and Pizza Hut. It is not true that everyone has an immediate family member injured in the mines. It is not true that all the women are obese. It is not true that the county started in farming; it was logging. It is not true that the county is devoid of highly educated professionals. It not true that all the people are sad, poor, and trapped. So much of what she said and implied is not true. I have only mentioned a few of the gross inaccuracies reported by Ms. Khazan, but the unmentioned are no less offensive and untrue. These misrepresentations are hurtful. It hurts her credibility; what little good she may have been trying to do is overcome by her need to prop up the stereotypes of Appalachia. But Ms. Khazan will move on, she will write more and better pieces, and her career will continue to advance. She will be fine. So, the real pain inflicted by this kind of journalism is inflicted, once again, on the good people of Appalachia, the good people from Grundy. Yes, the area has problems; it struggles in some ways, like many cities and towns in the U.S. But it is a unique, beautiful, and good place filled with good people. It is a place driven by honor (read Malcolm Gladwell’s book Outliers, chapter six) and family. It is a place that for many is inescapable, not because they are trapped there, but because the love and connection to place and family is too strong to leave or stay gone. The pain is that we cannot make people look at Appalachia and see beyond the negative image and antiquated stereotypes. We cannot make people see what they refuse to look for to find what we know is there. Grundy is indeed a small town. Three state roads serve as the primary routes in and out of the county (Routes 460, 80 and 83). Routes 460 and 83 are the primary routes into the town of Grundy. The route Ms. Khazan could have taken to reach her Grundy destination is therefore limited and obvious. I no longer live in Grundy, VA. However, I lived in Appalachia for 30 years and 25 of those years were in Grundy. While I left most recently in 2011 for a career opportunity in the Midwest I return at least 5 times a year to visit my immediate family. The mountains of Southwest Virginia are part of my identity. The love, loyalty, respect, and hard work that those mountains taught my parents and grandparents lives on in me. In the words of Hazel Dickens “can’t you feel those hills around you, can’t you feel that touch of home, don’t you wish you’d never gone, there are some things memories can’t bring home.” I miss Southwest Virginia everyday. There’s nowhere else like it. Posted on October 30, 2014 by It is pretty. Appalachia is more than a place. The Appalachian Mountains are rich with customs, food and dialect that is not found anywhere else. Those mountains are at the core of the people who were raised there or have adopted it as home. The mountains become part of who we are, why we are, and how we go about what we do. One of the things that many Appalachia natives are particular about is how we say our name. This is also something that many people from elsewhere do not understand. In Central Appalachia, where I am from, it is app-uh-LATCH-uh, not app-uh-LAY-sha. I am told that there are people in Appalachia who were taught to use the latter pronunciation. Fair enough, I obviously get regional dialect. Please understand, when you say App-uh-LAY-sha in much of Appalachia people, in addition to knowing immediately that you are not a local, may think you are trying to be fancy or worse. How you say the word Appalachia matters. As you can tell, I and many others feel strongly about this word. So, when stumbling around on the internet I found a company called Pronunciation Tees I was super excited. What do these people do? Well, they get me and my people. Pronunciation Tees produces t-shirts that proudly display the proper pronunciation of Appalachia – [app-uh-latch-uh]. Help raise awareness about the infection known as [app-a-lay-sha]. I encourage everyone to support these brave and creative folks. It’s cool, it’s fun, and it’s just plain right. Enter your email address to subscribe to It is pretty. by email. Happy siblings day! Mam’s girls and 2 of her grand girls. It is pretty here in Northeast Indiana.